For those wanting to order Choose Life plates, they are now available at all county offices across Iowa! You may also order them online below. Proudly display your Pro-Life convictions on ALL your vehicles-automobiles, multipurpose vehicles, sport utility vehicles, vans, motorcycles, trucks, motor homes, trailers and travel trailers!! Note: all Choose Life plate applications should be directed to your local county treasurer’s office. (October 4, 1922 – April 28, 1962) was an Italian pediatrician, wife and mother who is best known for refusing both an abortion and a hysterectomy when she was pregnant with her fourth child, despite knowing that continuing with the pregnancy could result in her death. Gianna was beatified by Pope John Paul II on April 24, 1994, and officially canonized as a saint on May 16, 2004. Gianna’s husband Pietro and their last child, Gianna, were present at the ceremony. 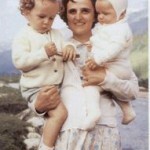 St. Gianna is a patron saint for mothers, physicians, and unborn children. to whom You have given the gift of life. our world today who are not thinking of motherhood. Your image – as well as theirs – made for eternal life. and all the needed care that a mother can give. Who lives and reigns with You and Holy Spirit, One God, forever and ever. Amen. As members of Catholic Daughters we will continue to support Pro Life Activities by prayer, financially, and with volunteerism.